This week I have two smashing games by John Dempsey. A re-telling of a tale that is a legend (with a bit added). An instructive position from a junior game. A picture of a naked lady playing chess with a sea lion. match that took place in Iceland in 1972. And a picture of a empty potato box. How many players under 2000 does it take to change a light bulb? None. They get Fritz to do it for them. J.Dempsay v S.Hogg Grangemouth Challengers, 2006.
identified by a Bishop on d3 and a pawn on d2. Scottish Championship a couple of times in the 80's. John Dempsey has won the right to play this opening. Giant Killing act of the Year. (I'll see if I can get the game). In this game the White set up resembles a Ruy Lopez. arose from a standard Lopez opening. a masterpiece when calamity. He knocks over the easel. ...White crashed with 28 Qd8? when 28 Qe7!! wins. A bitter shame. Here is the complete game. Lets us stay with the Kopec system a wee while longer. Here is an excellent game by the creator of the system. enough to spot the 19 Bxf7+ trick and Black is toiling. Nice exact wrap up with the King being hunted down by the minor pieces. Now let us stay with Danny Kopec for a wee while. This story has passed into Scottish Chess Folk Lore. I can fill in some of the pieces. D.Kopec v M. Condie, The Scottish Championship, Troon 1980. In this position White played 17 Qb3 and went onto win (51 moves). the beautiful variation. 17 Ng6+!! fxg6 18 Nh4 and wins. showing Danny the missed brilliancy on move 17. Danny was furious with himself, he was such a perfectionist. He thought everyone in the room had seen the win but him. and just Roddy, he visibly cheered up. to see that move." he said. "Nobody else saw it...Just McKay." Danny Kopec had a lot of respect Roddy McKay. it was analysis - can anyone help clear this one up?). Right back to John Dempsey. 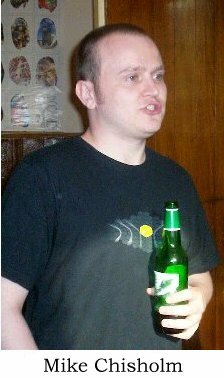 J.Dempsey v M.Chisholm Grangemouth Challengers, 2006. Another interesting John Dempsey game. And I'm afraid another loss. This game transposes into the Two Knights Defence. books for you. (there is no known bust to 5...Ne4 so ignore it). down and does not have anything for it. What is required is what I call 'The Dogs Dinner Plan'. Mess things up so the board is covered in tactics. Activity mixed with every cheapo you can think off. Positional considerations go right out of the window. involved in an ending and everything is expendable. busted before turning the game into a Dogs Dinner. 14...Qg6!? and it's game on. 15 Bb7 hits the Queen and g2. End of analysis. all he has to do is survive the Black counterplay. White stopped the first attack. Black throws the f-pawn and h-pawn into the battle. Black has fired his last bullet, White falters. On move 25 he should have gone onto the offensive with 25 Rfd1. and it is suddenly all over. Rook for the Knight on e4. Selina Johnstone v Paul Barnaby, British U10 2006. It's Black to play. White has just play 14 Bxe4. White will defend it with f3. Bishop and prevent f3....See it? Of course. 14...Qh5. Hitting e4, Pinning the f-pawn. unprotected. Thus 14...Qh5 15 Bh7+ Kxh7 16 Qxe8. Well spotted Black. Not quite. 15 Bh7+ Kf8! The first thing you must think of when someone sacs a piece against you. "What happens if I don't take it?" A Naked Lady Playing Chess with a Sea Lion. Fischy v Spassker World Championship 1972. Here is a link from Chris McKay. Some interesting pictures from Reykjavik 1972. One odd thing is that the pictures appeared to have been flipped. It's a black square on the right. Who is C.J. 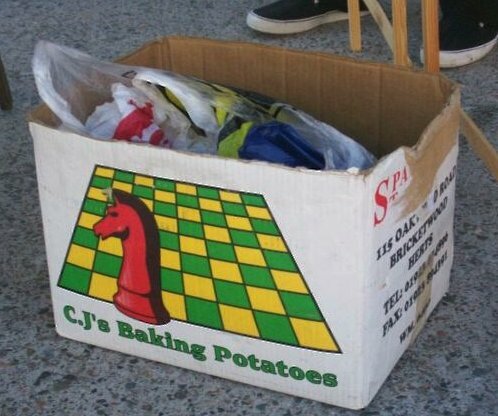 and what do his potatoes have to do with Chess?